During the semicentennial history of Computer Science and Information Technologies, several thousands of computer languages have been created. The computer language universe includes languages for different purposes: programming languages, specification languages, modeling languages, languages for knowledge representation, etc. In each of these branches of computer languages it is possible to track several approaches (imperative, declarative, object-oriented, etc. ), disciplines of processing (sequential, non-deterministic, parallel, distributed, etc. ), and formalized models, such as Turing machines or logic inference machines. Computer language paradigms are the basis for classification of the computer languages. They are based on joint attributes which allow us to differentiate branches in the computer language universe. Currently the number of essentially different paradigms is close to several dozens. The study and precise specification of computer language paradigms (including new ones) are called to improve the choice of appropriate computer languages for new Software projects and information technologies. 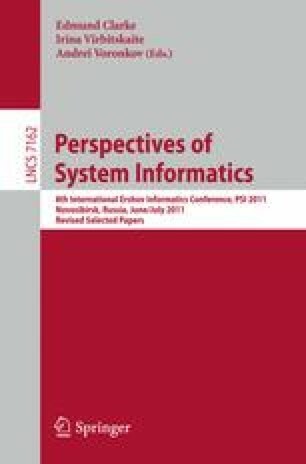 This position paper presents an approach to computer languages paradigmatization (i. e. paradigm specification) and classification that is based on a unified approach to formal semantics, and an open wiki-like ontology for pragmatics, formal syntax and informal “style”. Research is supported by Integration Research Program 2/12 of Russian Academy of Science.